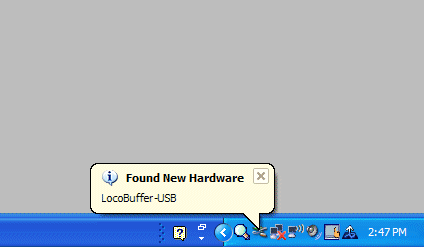 When you first plug in the LocoBuffer-USB it should pop up a little balloon that says something like "! Found new hardware LocoBuffer-USB." 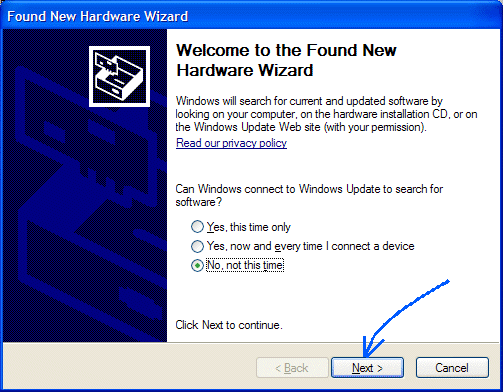 In a few seconds a "Found New Hardware Wizard" window opens up. Check the little circle that says "No, not this time." The "Next" button becomes active. Click "Next". A window opens up that asks you to put in the driver CD. That is all you need to do. 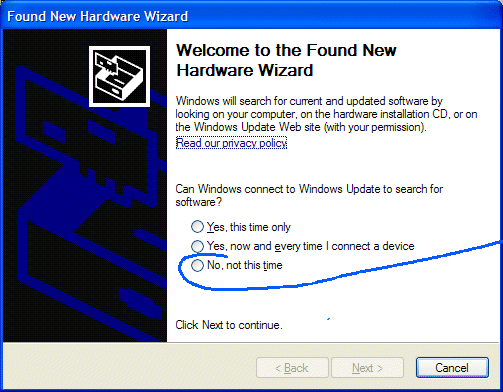 Once you load the driver CD it should automatically find the correct files and go on to the next window without the need for checking any boxes, making any selections, nor clicking any buttons. Windows then pops up a warning message from Microsoft about not having passed Windows Logo Testing. 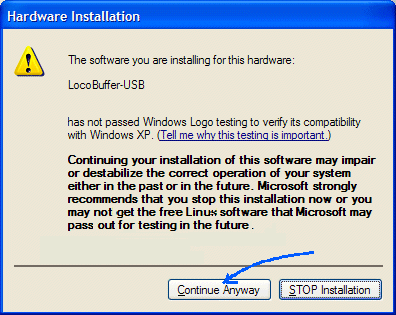 Not being a corporate supporter of Microsoft, we have not paid them to put their logo on our version of the driver, so you will need to click on the button that says "Continue Anyway". 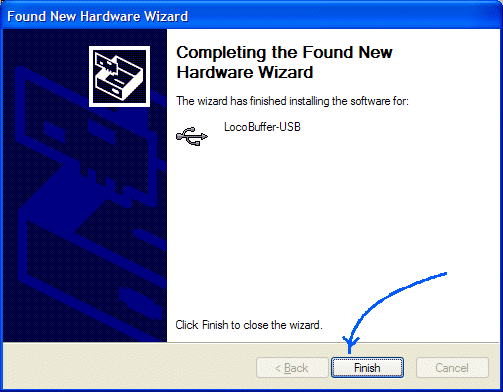 It should then continue automatically to the point where it says "Completing the Found New Hardware Wizard" and you can click on "Finish"
As soon as you click "Finish" the computer acts like it hasn't paid any attention to what it just did, so you have to do it all over again. Of course this time the CD is already in the drive, so you just click "Next" at that point. Again tell Windows that this driver will not do any bad things to the system, and it will soon proceed a second time to the last screen where you can click "Finish". At this point you should have the driver installed such that Windows will remember it. If you unplug the LocoBuffer-USB, Windows should make a "bink-bonk" sound. If you plug it in again it should do a "bonk-bink" sound, but not make you install the drivers again, even if you use a different USB port. 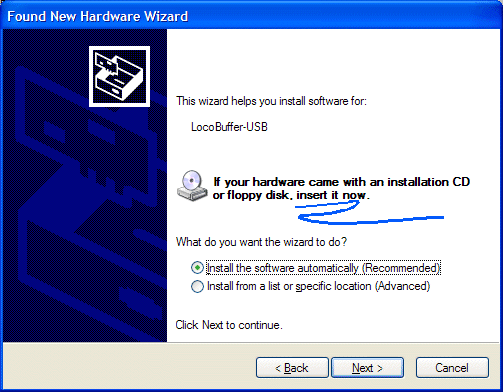 Once you have installed the Windows drivers and have your LocoBuffer-USB connected, then you can start up your software. Your software will not load properly until after the drivers are installed. Go into the Windows control panel system information area, (Start - Control Panel - System) then click on the Hardware tab and select Device Manager. Open up the Ports section and check that the LocoBuffer-USB shows up as an option. If it is not there, it didn't install correctly. The COM number shown with the LocoBuffer-USB entry is the one to use with your software when you set its preferences.